Serving customers with over 100 years of excellent service, the Mercedes-Benz is going to awe you again with its SL63 AMG that is in our Miami luxury car rental garage. Being an experienced car manufacturer, Mercedes-Benz knows just what every customer needs. With this model of SL63 AMG, Mercedes-Benz presents you with its best attempts in creating an all-winning supercar that meets your every demand. 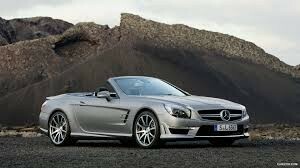 The Mercedes-Benz SL63 AMG is powered with 577 horse power engine that runs at 5,500 rpm. With that amount of power in store, SL63 AMG is engineered with 7-speed AMG SPEEDSHIFT transmission, allowing it to accelerate up to 60 miles per hour in 4.1 seconds. With a top speed of 155 miles per hour, the Mercedes-Benz SL63 AMG is fast enough for all purpose driving. This is a type of luxury car that is not too demanding on both sides. You can always be satisfied with its adequate speed performance, and the car does not demand you to be super drivers everytime you get its tires on the road. The interior is just as expected from a luxurious Mercedes-Benz cars; comfort and beauty. The convertible roof top is an accessory that makes the Mercedes-Benz SL63 AMG look good, with or without it. Aside from the comfortable leather-covered seats for two, the SL63 AMG is built with a safety-enhanced features. First invented by the Mercedes-Benz team, the ATTENTION ASSIST is a technology that monitors various driving patterns at all times. The feature is equipped with a visual and audible warning if it spots any strange behavior of sleepy or drunk drivers. There is also PRE-SAFE which serves as a program that detects dangerous maneuvers and react through the devices inside. Should it sense any danger, it can tighten seatbelts, close the front window, and adjust everything to prevent damage to the passangers. Driving an SL63 AMG is a free-from-worries experience. You can enjoy your moments, and let the Mercedes-Benz does the rest!